I posted the original recipe and method for these a few months ago, but never quite got round to converting the recipe from cups into metric measures. The teen and I made these as part of our spurious Chinese New Year's Eve feast dinner this weekend so I have finally got round to writing up the metric measures. This time we made the filling with minced chicken thighs (including the fat & a bit of finely chopped skin) replacing the pork, as we were having pork belly elsewhere in the meal, it made a great substitution with a dash of chinese rice wine & an extra pinch of salt. Please refer back to the original post for the original filling and method here. Divide the dough into 4 equal pieces. Leave all but 1 piece in a bowl under a damp tea towel. Dust your work surface with corn starch and roll out the small piece of dough until it is between 1/16th" & 1/8th" thick. Using a 3-3.5 inch round cutter, cut out as many shapes as you can, put the circles to one side under a damp cloth and carry on with each piece of dough in turn. I found that if you collected up the trimmings and sprinkled a couple of drops of water on them, you could combine them into the next piece of dough without any problems. Carry on until all the pot stickers are cut out. 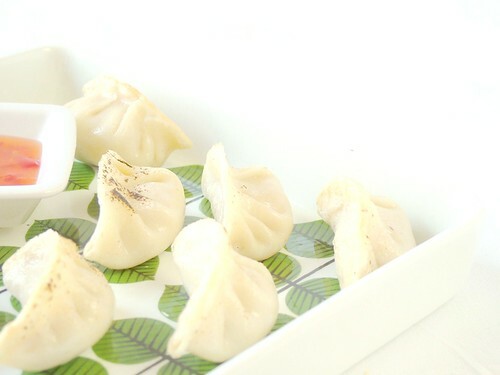 This recipe makes 50 dumpling skins. Beautiful pot stickers. We eat a lot of this at home. My family loves pot stickers.